The 'ghost town' graffiti tried to save Jump to media player Doel, a graffiti artist's paradise, was once a picture perfect Belgian seaside village. Now it faces demolition. 'It's like the end of the Earth' Jump to media player The Dungeness estate in south-east England is up for sale, and the residents are worried. People 'excited' by Banksy's Dismaland Jump to media player Banksy's Dismaland exhibition in Weston-super-Mare opens today. Londonderry fire temple to peace Jump to media player A huge temple that overlooked Londonderry for the past week has been burnt down as a gesture of letting go of the past and looking to the future. Seeking the disappearing petrol stations Jump to media player Andrew Parker is trying to capture the beauty of Britain's local service stations before they all disappear. The secret world of London's Mail Rail Jump to media player London's underground Mail Rail system has been dormant for years, but may get opened to the public. 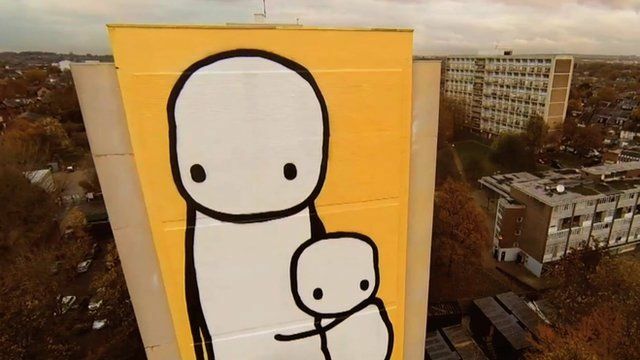 He has lived in a homeless hostel and dodged police to put his mark on the city, but now London-based graffiti artist Stik is invited all over the world to paint huge murals of stick figures, many of them offering social comment. They can be seen in New York, Tokyo and London - where he has painted the tallest piece of street art in the UK, standing at 125 feet (38m). Stik's works, which hang in the homes of Elton John, Bono and Brian May as well as being on the street, have been brought together in a book. His latest piece, Sleeping Baby, has a limited edition print with 100 per cent of sales going to art projects at Homerton Hospital. Stik, who refuses to talk about much of his life on the street, showed BBC News around his studio and some of his favourite works.